Often a Jeep CJ or YJ can be given a new lease on life by simply welding in some sheet metal patches. 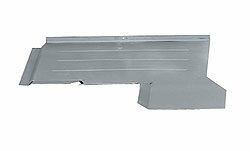 We have compiled an entire selection of replacement sheet metal that can put your older Jeep back into action. Welding will likely be required, so experience is a must. Choose from our wide selection. All sheet metal is ready for primer and paint. ***Trimming and shaping may be required. Professional installation is recommended.